*H Kuhn will undergo late fitness test, after undoing concussion before previous match. He will be risky selection for head to head. *Aaron Phangiso is likely to come in playing lineup, as pitch in past have supported spinners. *A Nortje too is likely to play today’s match. He is in good bowling form but is getting rested frequently. *R Mclaren inclusion in playing lineup is doubtful due to injury. 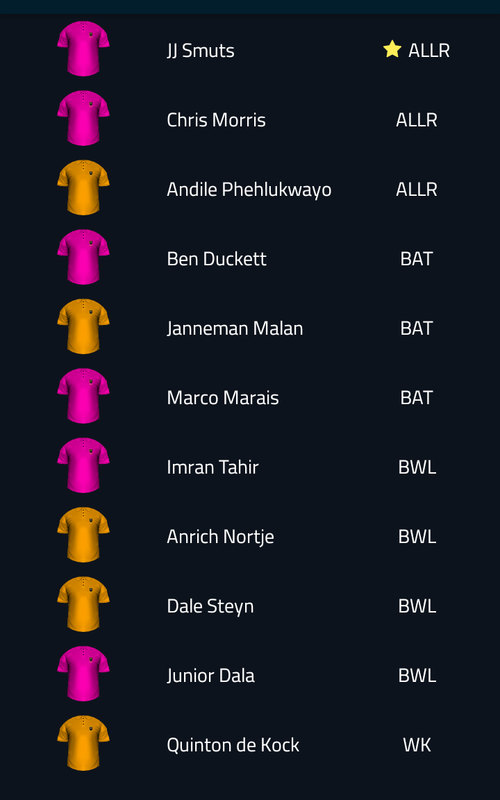 *Nortje is a risky selection as he was rested in previous match. *I will play with Risky Team. Thanks for ones marvelous posting! I really enjoyed reading it, you may be a great author.I will make certain to bookmark your blog and may come back sometime soon. I want to encourage that you continue your great work, have a nice day! It’s a shame you don’t have a donate button! I’d without a doubt donate to this outstanding blog! I suppose for now i’ll settle for bookmarking and adding your RSS feed to my Google account. I look forward to new updates and will share this website with my Facebook group. Talk soon!